Packing yogurt in the Yumbox - no leaking! This was one of Heidi's lunches from last week. She has wanted to have yogurt in her lunch quite a bit lately. 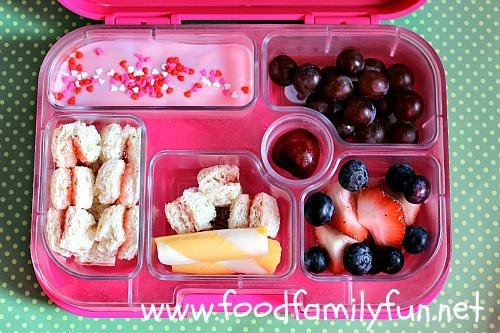 The Yumbox is perfect for that! Each compartment seals when the lid is closed so there is no leaking between the compartments and her yogurt stays put until lunchtime. yogurt with sprinkles, red grapes, strawberries & blueberries, cherry, cheese, strawberry jam sandwich bites. Here are a couple of items that I used when making this lunch. 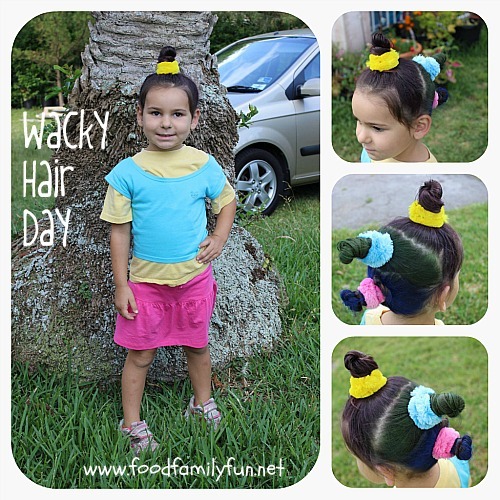 Today was Wacky Hair Day at school. Everyone who participated sent in a minimum of $2 that will be donated to the St Baldrick's campaign. Heidi had a cute bun hawk 'do. 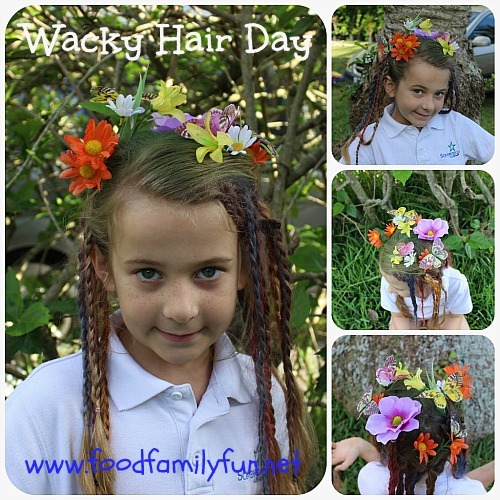 Amy had lots of mini braids and a flower garden with butterflies. Her braids are all sprayed in a rainbow of colours. Rose's class had their class End of Year Party at the beach today. 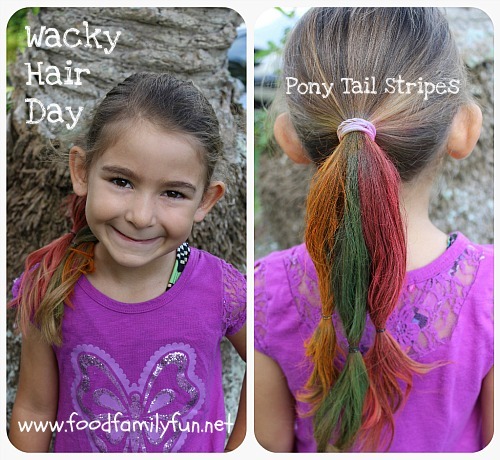 She still wanted to participate so she had a bit of wacky hair with a few coloured stripes in her pony tail. They were happy with their hair, and we had loads of fun on the beach with Rosie's class today. We have only a few days left of the school year for the 3 eldest girls and Emily has already finished up play group for the year. Woo hoo! Here is Rose's lunch from yesterday. She's been a lunch time vegetarian these days. Now that I think about it, she is vegetarian for most breakfasts too, but she does prefer a few non-veg dinners. 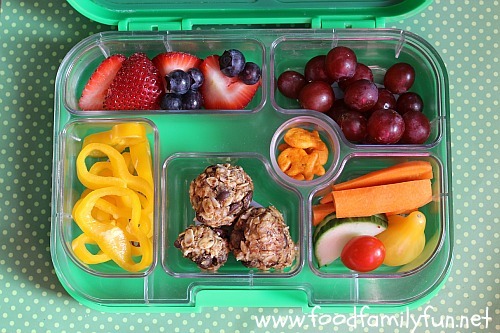 strawberries & blueberries, red grapes, mini yellow peppers, no bake energy bites, goldfish, carrots, cucumber & tomatoes. These little energy bites are a family favourite and I seem to be constantly making them these days. I often tweak it a bit if I run out of something, I might add a Linwoods seed mix instead of chia, sometimes wheat germ, sometimes ground flaxseed, half the chips as mini chips + a few currants, Enjoy life dairy free chips and almond or soy butter to make them peanut and dairy free and so on. This time they are made exactly as the recipe suggests. I swear that I have been making lunches for my girls during this loooong blogging break! Sometimes I'm so busy living life and getting the daily tasks accomplished there just isn't any time left to blog about it! I'm sure my fellow bloggers out there know how easily this can happen if you don't dedicate blogging time. My real problem seems to be in the morning, no time to snap a photo before the lunches go off to school!